On July 18, 2018, the European Commission fined Google €4.34B for anti-competitive practices. In its opinion, Google has created a monopoly with its Android operating system in Europe and, as result, stifled competition in an illegal manner. In my opinion, Google has allowed for cheaper phone prices, flexible app development, and an easy to use interface for customers to access multiple new technologies because of a common platform for innovation. I also believe the thought process behind the fine is potentially creating a market environment that suppresses enterprises’ ability to embrace models that encourage open, rapid innovation. Starting in 2011, Google leveraged a data-driven revenue model by giving away the Android operating system to mobile manufacturers with the condition that they pre-install Google applications and the Google search engine on their phones. Google sometimes incentivized the manufacturers to do so. The model elevated Google’s Android global smart phone market share from 36% in 2011 to 83% in 2014. Because of the overwhelming Android market share, Google attracted developers to write more apps for the Android system, which in turn attracted more users. This data-first policy has positioned Google as the world leader for data collection and has enabled it to generate 90% of the company’s overall revenues from AdWords and AdSense. A key factor in the European Commission’s decision to hit Google with the massive €4.34B fine component is that it does not acknowledge Apple as a direct competitor in the space, as Google maintains 90% market share in the EU. 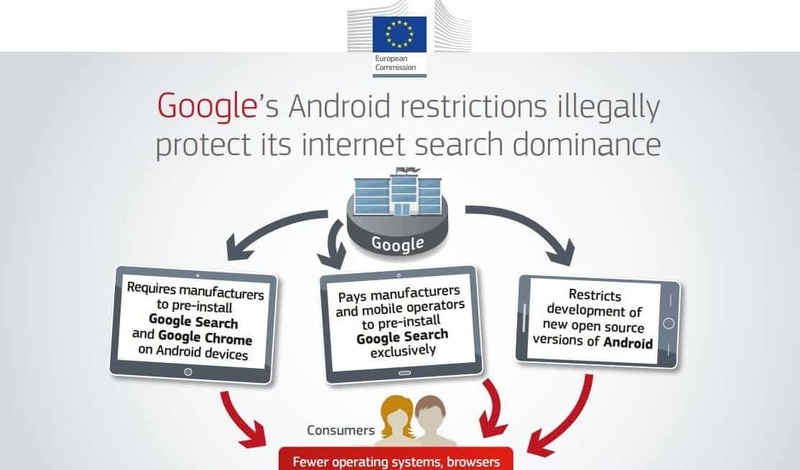 A key distinction the European Commission made is that Google licenses Android for free to all manufacturers and has not allowed the manufacturers to use Android forks (for example, Amazon Fire), while Apple installs iOS on Apple phones and controls the process from manufacturing to operating system. This led the European Commission to conclude that Google’s practices have led to a monopoly in the marketplace and, as such, it must bring the illegal conduct to an end within 90 days. Looking at this situation from a very different perspective, I believe that Google created a market stronghold for user data and that it is being punished for creating an innovative business model. Its primary goal was to be the platform that all manufacturers relied on, rather than competing directly for consumers to purchase its phones. (Google did not enter the hardware space until the Google Pixel was released in 2016.) Its model provided a stable, common platform for manufacturers and developers, and allowed for compatibility, choice, and opportunity. The European Commission has a duty to ensure that a competitive marketplace exists for citizens. To have Google change its current practices and allow users to have the option to choose the platform they want is fair in terms of promoting competition in the operating system market, particularly given Google’s current overwhelming monopoly. However, handing Google the largest fine in European Commission’s history does not take into account the benefit that the region received with the growth of Android. On a much more macro level, the fine seems to discourage enterprises from embracing a model that will help give them a competitive, sustainable advantage, because if it becomes too successful, the EU will not only act to level the playing field, which is its duty, but also impose large fines on companies that carve out a competitive advantage. What is next for Google? It will undoubtedly fight the EU fine, which will push back the sentencing for years. Indeed, after the fine was imposed, Sundar Pichai released a public statement justifying the innovation Android has brought to the mobile device market. The company believes Android provided a stable, universal platform for developers and companies to build mobile apps during the period in question…and I tend to agree.